The SanDisk Ultra® Dual USB Drive 3.0 is compatible with Android™ smartphones and tablets with OTG (On-the-Go) USB support1 and designed to let you easily move files between Android™ devices and PC or Mac computers. Quickly free up space on your Android™ smartphone or tablet so you can take more pictures and videos. 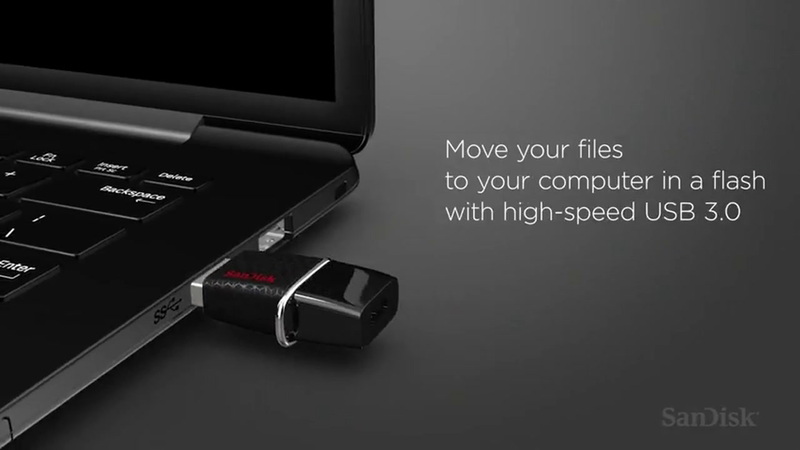 High-speed USB 3.0 lets you transfer a full-length movie to the drive faster than with a standard USB 2.0 drive3, up to 150MB** [32GB-256GB*] and up tp 130MB** [16GB*] from computer to drive. Available from the Google Play™ store, the SanDisk Memory Zone app lets you view, access, and back up all the files from your phone's memory in one location2. It can also automatically move files from your device to your drive to free up space. ** (32GB-256GB) Read speeds from drive to computer up to 150MB/s. (16GB) Read speeds from drive to computer up to 130MB/s. Write speeds lower and vary by drive capacity. USB 3.0 port required. Based on internal testing; performance may be lower depending upon host device. 1MB=1,000,000 bytes. 1 Requires device with On-The-Go (OTG) support. See www.sandisk.com/dualdrive for list of compatible devices. 2 Download and installation required. 3 Based on a 1.2GB MPEG-4 video transfer with USB 3.0 host device. Results may vary based on host device, file attributes and other factors. © 2018 Western Digital Corporation or its affiliates. All rights reserved. SanDisk and SanDisk Ultra are trademarks of Western Digital Corporation or its affiliates, registered in the U.S. and/or other countries. Android and Google Play are trademarks of Google Inc. The Android robot is reproduced or modified from work created and shared by Google and used according to terms described in the Creative Commons 3.0 Attribution License. Mac is a trademark of Apple Inc. All other marks are the property of their respective owners.